So the craziness has begun. We are officially out of our house and in a little one bedroom apartment on the other side of town. It's not too bad actually. The location is right near the great food coop that I sadly rarley go to because it's such a pain to park and exit the lot. It's also a stones throw from downtown and it's restaurants and stores...and the college. That's the only sticking point. It's a popular area for students. And we have four of them, boys, living directly above us. They're nice enough guys, but you know, that age, not the most considerate. Nothing major, just alot of loud music and stomping around at 2am. Sam seems no worse for the wear and sleeps right through it. Jay and I are working on it. The kitchen and bathroom are kinda gross...alot of caulk holding stuff together. The place could use a good steam cleaning. Everyday while Sam naps I try to knock out a corner with my scrub brush. It always looks better when I'm done, but still dirty. The stains on the countertop are not going anywhere and it's driving me nuts. Probably not the best situation while my nesting instinct is gearing up for the new baby, huh. Well, it's only 2 months. Then were back home. Hopefully construction will be far enough along that it won't be too bad to live there. Who knows, maybe I'll long for our dingy one bedroom rental once I'm thrust into the mess of home renovation. 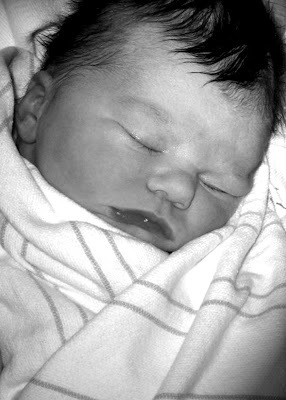 Congratulations to my sister and her husband in welcoming little Kaylee! Not sure if I'm spelling that right. The only written correspondence I've gotten was before she had a name. But what a cutie. And look at all that hair! Reminds me of a certain little boy I know. Of course, by the time he was 4 months old most of it had fallen out. I hope that doesn't happen to Kaylee. 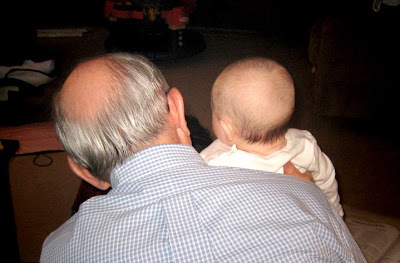 Or at least that it ALL falls out, instead of just the the top so she doesn't end up with a hairline like her Grandpa. Kaylee's little cousin to be? It's a boy! Sam is going to have a little brother!! I know this is alot of news for one blog post. Maybe I should have broken it up into two? So I'm going to be completely outnumbered. The only girl. Sure, this creates the whole "Third Child" discussion, but we'll just wait on that. Right now we're just excited to have another little guy to chase around. I'm so excited about the idea of brothers. I can only imagine the trouble they'll get into. Good trouble. I'm talking the silly boy kinda trouble...not the jail kinda trouble. So much excitement! And in a couple weeks I head to Florida so Sam and I can check this little girl out in person. Oh, I hope she still has that new baby smell. I don't remember how long that lasts. I hope Sam takes at least a little interest in her. There has been a baby explosion in our neighborhood and when presented with a brand new babe, he really couldn't care less. But maybe he'll be different because he's related? hm. We'll see. 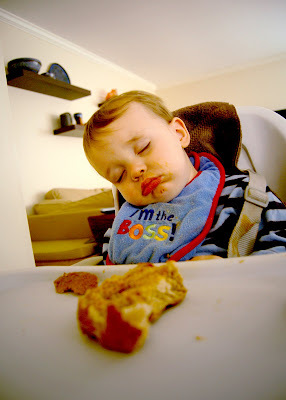 SOOOoooo, heres' a pic from the other day when Sam fell asleep eating his lunch. He's never done that before so of course I took a million pictures. I wonder if the new little guy will be photographed quite as much as his older brother. I would imagine not, but I'll sure try!